We aren't doing much that is special for the day. You see, this is the day that my mind believed I would be having a baby. I know that sounds silly. No one can know with certainty what day a child will be born, especially a child who is now in Heaven. But each of my four children here on earth were born exactly nine days after their due date. That includes the two who were "induced" and the two who weren't. Even the one who's due date was recalculated a couple of different times. Nine days exactly! So last spring, when the the test turned pink, the first thing I did was calculate my due date and add nine days. 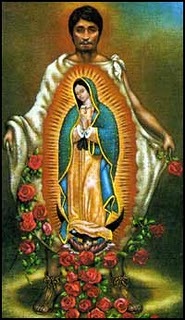 And then I placed this picture of St. Juan Diego very prominently in my room and started saying the Litany of the Blessed Virgin Mary. Today is that day and my body (or rather, my anxiety level) has been warning me all week of it's impending arrival. Unexplained crying, anxiousness, and restlessness heralded the nearing time. I was not surprised. The body and soul are separated only through death. When the soul hurts, the body responds no matter what activities are now scheduled on the calendar for the day. I wasn't going to write this post. I've started and deleted it multiple times. There are so many others out there who have suffered through greater grief and in many ways I don't feel worthy to compare my suffering to theirs. But I just couldn't keep this pain secret because there might be someone else out there wondering if their expression of the same kind of pain is normal. Personally, I have tried to embrace that "normal" is only a setting on my dryer, but for lack of a better word, yes... it's normal... for me. It might be normal for you, too. I appreciate your sharing, Charlotte! It is good to know I'm not the only one---although my unexplained tears and frustrations were due to my late mother's birthday on the 7th. Take it easy on yourself today. God bless you! Oh, Charlotte, I yearn to give you a hug! When I think of you throughout my days I'll lift you up in prayer. Thinking of you today with much love and prayer. I'm so very sorry, Charlotte. Know that you have many prayers today, and I hope the thought, at the very least, gives you comfort. The prayers will, hopefully, bring you grace. St. Juan Diego, pray for us. I was thinking of you last month. I am so glad you shared. I will be praying for you today as well. This is always so painful, isn't it? Know that you are being lifted up in Mary's arms. What a beautiful star you have in heaven right now! Oh ... I am so sorry. God bless you on this difficult, "normal" day. You can count on prayers from me today. Your site is always a blessing. Thank you for the opportunity to bless you back. my prayers for you today. Every year, on January 21, I have the same feelings. It does get easier as time passes, but that day never goes by without my longing a little for that sweet baby, who would now have been 14 years old this coming January. Hugs to you today! Just let yourself be. Sending much love and prayers to you Charlotte on this difficult, sad day. Oh Charlotte. Yes, it is normal to grieve. I am so glad you wrote this so that we could grieve with you and pray with you so that you don't have to carry this pain in your heart all by yourself. I will be praying for you today. I wish I could be there to give you a hug and share a cup of tea with you. I understand, dear friend. You know I understand. Dear Charlotte, you're not comparing your grief merely explaining it. Praying that you find solace for your aching heart. I'm sorry for your loss Charlotte. We should never diminish our suffering in light of others, for it is ours to bear and not compare. I hope you are lifted by those who love you today. I agree with what Kathy said "Dear Charlotte, you're not comparing your grief merely explaining it." Each person's path is different....and each path has it's own happiness and it's own grief. Thank you for sharing; sometimes it is easy to forget that the writers of these beautiful Catholic blogs have difficulties and sadness. Extra prayers for you today. Prayers for you today. May Our Lady comfort you. Praying for you today. Thank you for sharing. I would've been about 36 weeks now and have a hard time not thinking about our lost baby in the midst of Advent. When all is pregnant with expectation, I have felt quite empty. Hold on hope. Am definitely saying some extra prayers for you, Charlotte, on this day. We also have a baby saint in heaven; no other words just a prayerful hug for you. Thinking of you today, Charlotte! Sending some prayers and online hugs your way. Thinking of you. Last year at this time I too was pregnant, just nearing 4 months. Out of the "woods" so I thought. Now I know that at this time last year my 5th had probably already passed on to be with our Lord....anyway. Thank you for sharing, you never know how it will touch a heart! My heart and prayers go out to you! I too am approaching my supposed-to-have-been due date with dread. This is no easy road, but at least our Lord is with us on it. So sorry. I would love to be able to be there to help you on this sad day for you. My heart and prayers are with you today. That is exactly how I have felt on those days. Sending you a hug along with the prayers! Just so you know, you're in my prayers, as are all mamas who have had to let go of babies. God bless you until the day you meet them again! Praying for you...January is my month to mourn--so many babies I have lost that month...I am offering my day for you. Wont' it be a glorious day when we are reunited with our little baby saints in heaven? :) Hugs. I'm so sorry, dear Charlotte :-( I have been thinking about you, especially during the rosary. I will continue to offer many prayers for you, dear friend! I'm glad you wrote this because it's comforting to know my sporadic, residual pain that pops up at unexpected moments is yes, normal, and healing, too. My thoughts and prayers are with you. I never thought that far ahead to calculate the due date, but there's not a year that goes by that I don't think about the little ones we lost on the days I miscarried them and they were carried to heaven. Hugs for you. So sorry Charlotte! Praying for you tonight. Big hugs! I am sorry for your loss. Indeed, it is heaven's gain. Sometimes when I think about our little ones who are there too, I am cheered by the fact that they are among the saints in heaven! Strange combination of emotions go along with this part of motherhood. Quite a contradiction. Take care & God bless.